Arco, IDAHO – The Arco Anarchy did something that no other team has been able to do this season. They forced the Dixie Rebels to pass. 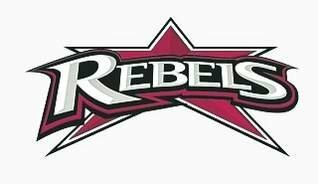 And as it turns out, Dixie can do that pretty well when needed as Misi Tupe threw for 208 yards and two TDs in the Rebels 23-6 win in the first round of the RMFL playoffs Saturday night at Butte County High School. Tupe picked apart the Anarchy defense, completing 14 of 24 passes. Backup QB AJ Martinez also had a TD pass on an improvised play after a blocked field goal in the fourth quarter. Things looked bleak early as Tupe turned the ball over on Dixie’s first two possessions. On the third play from scrimmage, Tupe fumbled the ball. 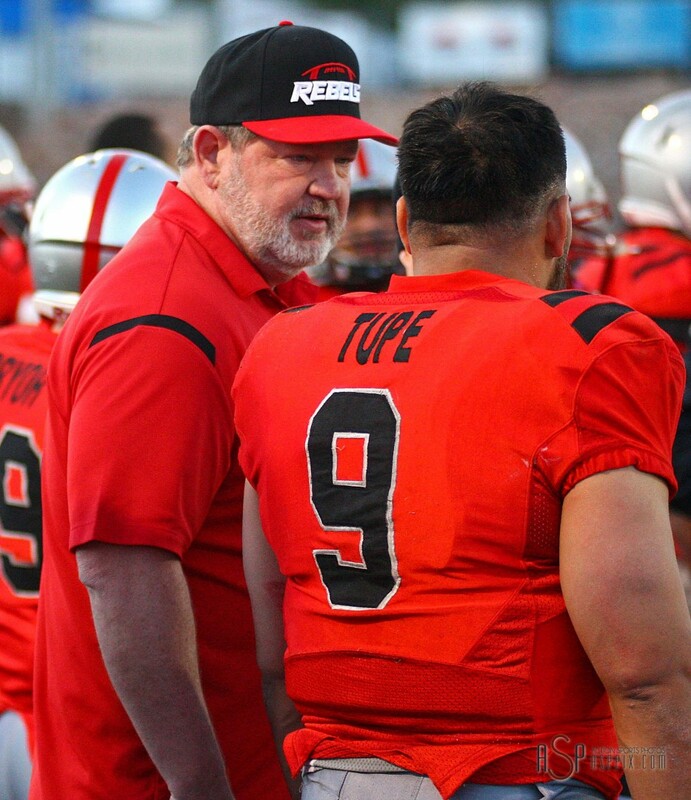 In the Rebels next offensive possession, Tupe was intercepted. Dixie scored its first touchdown shortly after the beginning of the second quarter when Tupe hit Brennan Adams from 38 yards out to go up 7-0. After Arco turned the ball over, Tupe hit tight end Jordan Loo for a TD strike at the 5:44 mark to put the Rebels up 14 going into intermission. Arco scored its only touchdown in the third quarter. Anarchy quarterback Bryndon Belnap found receiver Brad Cook from 20 yards out to cut the lead to 14-6. The Anarchy was not successful on their two-point conversion attempt. Nursing a 14-6 lead in the fourth quarter, Dixie lined up for a game-clinching field goal with 5:44 left. Kicker Eric Brooksby had uncharacteristically missed an earlier attempt in the first half. After another breakdown resulted in a blocked kick, holder/backup QB Martinez called a fire audible, rolled out and found defensive end Jordan Main, who had lined up in the tight end spot, all alone in the end zone. After the PAT, the Rebel lead was a comfortable 21-6. The Dixie defense tacked on a safety on a sack of Belnap by Main with two minutes to go in the game for the final score, 23-6. Along with his big passing day, Tupe also carried the ball 10 times for 73 yards. Adams had six receptions for 104 yards. Tanner Wood caught four passes for 41 yards. Defensively, Brandon Thompson had two interceptions. Shawn Mitchell and Matt Feula also intercepted the ball. For Arco, Belnap completed 6 of 13 for 97 yards and a touchdown. Cook and Koby Spencer snagged three receptions apiece. Arco’s introductory season in AAA ends. After going 5-3 and winning the Idaho Division, the Anarchy drew the unenviable pairing against the team that has been rated No. 1 all season long. Dixie, 8-1, will travel to Brigham City and face the Brigham Sting next week in a semifinal matchup. The Sting, 7-1, suffered their only loss a month ago in a 35-19 defeat at the Utah Stealth. The other semifinal will feature the Stealth, 7-2, at the Wasatch Revolution, 7-1.